The Dalite 11 x 19' Ultra Velour Drapery Kit is a great way to add a touch of professionalism to your presentation. The drapery system provides a neat and "finished" look to the screen. 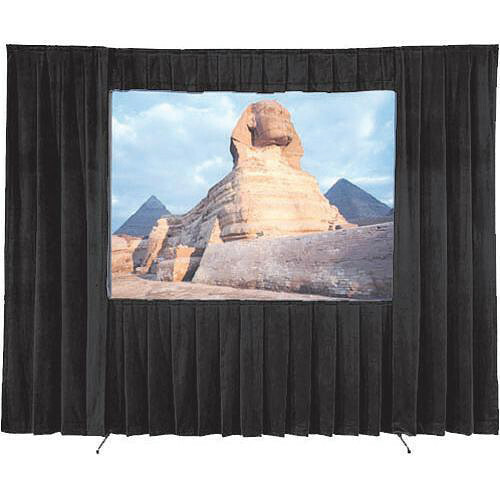 It is a 14 oz, fire retardant cotton velour drapery that attaches with snaps to Fast-Fold screens to enhance the image and assure that your audience's attention remains fixed where it should be. The fabric features extreme opacity from ambient light as well as being "sound neutral" which produces a more clean and natural audio performance. The Ultra Velour fabric has an edge over previous versions of similar fabrics since it is now machine washable. This saves time and money on dry cleaning. The wheeled case makes transport easy.